A fun and bustling city, Siem Reap is where most travelers to Cambodia will stop off in order to see the stunning temple complex of Angkor Wat. 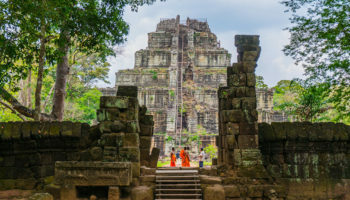 Built by the Khmer Empire and dating back to the 12th century, the temples of Angkor attract thousands of tourists annually from all over the world who are drawn there to admire the awe-inspiring Khmer architecture that was hidden for almost a thousand years by the depths of the Cambodian jungle. The temple complex remains a sacred Buddhist site and to this day is the largest religious monument in the world. Siem Reap is located just a short taxi or tuk tuk ride away from the historic temples of the Khmer Empire at Angkor and a huge tourist boom has led to a large range of accommodation springing up across the city. From luxurious spa resorts to backpacker hostels, and everything in between, there really is something to suit every budget when it comes to finding somewhere to stay close to Angkor. Siem Reap still continues to be a Cambodian city, but with the rise of global tourists to the country the city is now packed full of bars, restaurants, massage parlours, coffee shops and markets meaning there is something for everyone to enjoy after busy days exploring the temples. If you’re looking for where to stay in Siem Reap that has a little charm and history, then you should look no further than the picturesque area of the French Quarter. Dating back to when Cambodia was a French Protectorate, there are many heritage buildings in this area comprising a mix of French colonial style and classic Chinese shophouses. Here you’ll find narrow streets with numerous cafes, restaurants, and shops, making for a relaxing pace of life during your time away from the ancient temples. 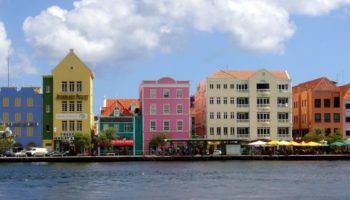 The area is laid out on a grid system meaning it simple to find your way around the streets and discover the many gems hidden around the Old Quarter. In the evening, as night falls, the streets light up with the glow of lanterns and people stroll around to find dinner at one of the many restaurants serving international cuisine. The King of Cambodia himself actually stays in the French Quarter when he is in town, at the grand Royal Residence. Though not ‘officially’ used as a residence anymore, and not open to tourists, the architecture remains impressive and, with the only green space in the city, the Royal Gardens right opposite the residence this area is an ideal spot to take a breath of fresh air in the busy city center. The hotels around the district are small and family-run with a friendly, welcoming atmosphere; rooms are very reasonably priced and often clean but basic. South of the French Quarter and within easy walking distance is the lively Pub Street, a great area to party into the small hours, as well as meet up with other travelers from around the world. 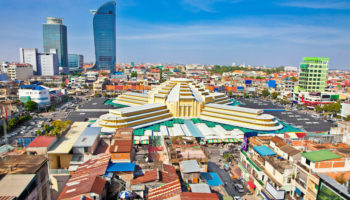 The Old Market or Psah Chas is located between Pub Street and the Siem Reap River, and offers a mixture of souvenirs and a variety of food stalls selling rices, dried fish, vegetables and fruits. Prince d’Angkor Hotel – Situated around a stylish outdoor saltwater swimming pool, this hotel is decorated in decadent dark wood. Some rooms feature four-poster beds and balconies. True to its name, there is a spa at this 5-star hotel, complete with relaxing baths and a fitness center. 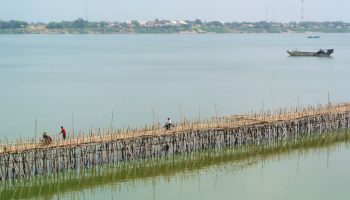 There are two restaurants onsite – one that serves up local Khmer dishes and another featuring an International buffet. You’ll also find a piano lounge here. It’s a good spot for those who like shopping, since it’s close to the Angkor Shopping Centre, amongst other malls. Chronivada Residence – This small hotel is decidedly boutique and boasts modern minimalism combined with a luscious garden overflowing with greenery. Aside from how it looks, the dedicated staff provide a high-end experience, making your stay here as comfortable as possible. You’ll find a compact but relaxing pool area surrounded by sun loungers, as well as an open-air restaurant next to the pool itself. The Amazing Residence – Situated close to Pub Street – but far enough away that you’ll still be able to get a good night’s sleep – the streets surrounding this 4-star hotel are packed with eateries. The interiors here are serene and stylish and it’s all been built around a long outdoor swimming pool. 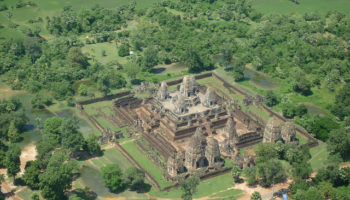 It’s got large decorated with imagery of Angkor Wat; they boast polished concrete floors and floor to ceiling windows. The restaurant at The Amazing Residence serves a wide range of dishes; there’s even a children’s playground. Chhay Long Angkor Boutique Hotel – This boutique hotel features bright and sophisticated interiors that combine touches of traditional Khmer design with modern comforts. The rooms are spacious with big beds, tiled floors, and whitewashed walls. For extra relaxation, there’s an outdoor swimming pool surrounded by sun loungers. Guests can drink and dine at the onsite restaurant and bar. Both Angkor Night Market and Pub Street are mere steps away from Chhay Long Angkor Boutique Hotel; however, the hotel is thankfully located on a quiet street. 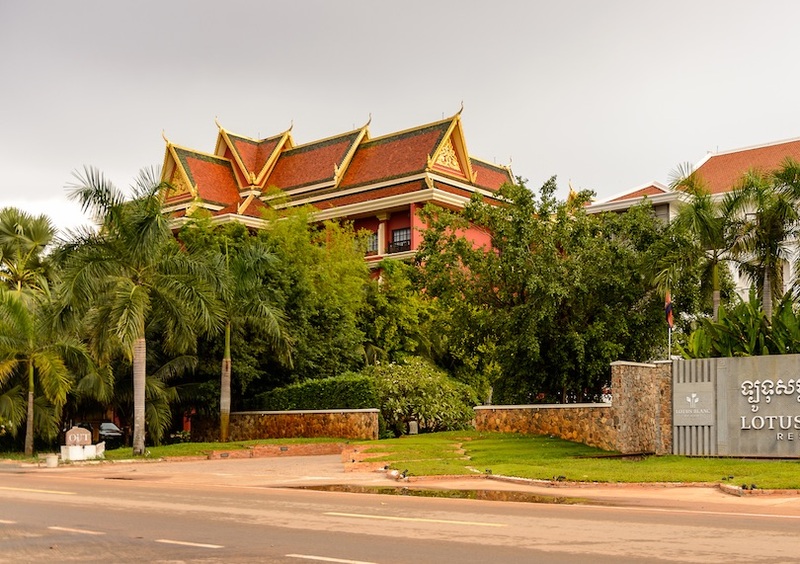 Mekong Angkor Palace Inn – For a 3-star hotel, the service at Mekong Angkor Palace Inn truly goes above and beyond what you would expect, providing a welcoming, stress-free stay in Siem Reap. Other than the quality staff, there’s a wonderful outdoor pool and an in-house restaurant, serving up a selection of different cuisines. The rooms are simple but clean and comfortable, with tiled floors, warm colors, and touches of Khmer aesthetics. From this hotel, it’s a 10-minute walk to the noise and fun of Pub Street. Uncle Sam Villa – Situated around lush tropical gardens, this charming hotel is set inside a villa – as you might tell from its name – and is decorated with hardwood paneling and furniture. There are fashionable polished concrete floors as well as minimalist bathrooms. The large bedrooms feature cozy beds and balconies with garden views. Colorful artwork of the local area adorns the walls. There’s a vibrant cafe onsite, too. This area of Siem Reap is named after one of the oldest temples in the city, Wat Bo, which houses a variety of 19th century wall paintings and is an interesting place to visit and spend time understanding more about modern day Khmer culture. Located on the opposite bank of the river to the old French Quarter, the hotels here come cheaper than those on the other side, and you’ll be spoiled for choice as to which hotel to choose. There are even some more luxurious options here for those with a bit more money to spend, often overlooking the river and facing the centre of town, meaning you can stay in peaceful luxury and spend time unwinding after an exhausting day’s temple-hopping. 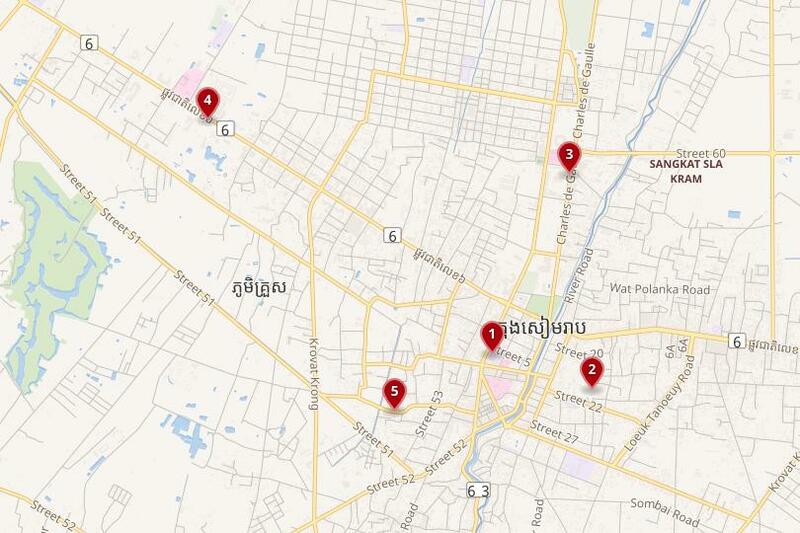 Though further from the center than other districts, Wat Bo is still only a few minutes away from the hustle and bustle of the center of town. The area boasts a number of international restaurants which serve up a selection of delicious dishes that cater to hungry foreign tourists that are staying in the district, from vegetarian food to Italian, and even Westerner-friendly takes on local dishes. If you find yourself needing a break from all of the temples Wat Bo also has a few art galleries which display work by local artists alongside workshops, local handicrafts and some small shops selling locally made souvenirs. Lynnaya Urban River Resort – A veritable oasis of calm away from the raucous nightlife of Pub Street, this luxurious hotel is set in sprawling, well-lit grounds dotted with palm trees and romantic seating areas. Guests can stay in a variety of rooms, each of which has been decorated in various combinations of white with natural wood accents. Some come with balconies, while some feature their own private gardens complete with bath! There’s a well-maintained outdoor pool for guests to enjoy. Borei Angkor Resort – Borei Angkor is a sizeable resort just a stone’s throw from the Royal Residence itself, amongst other things to see in Siem Reap. 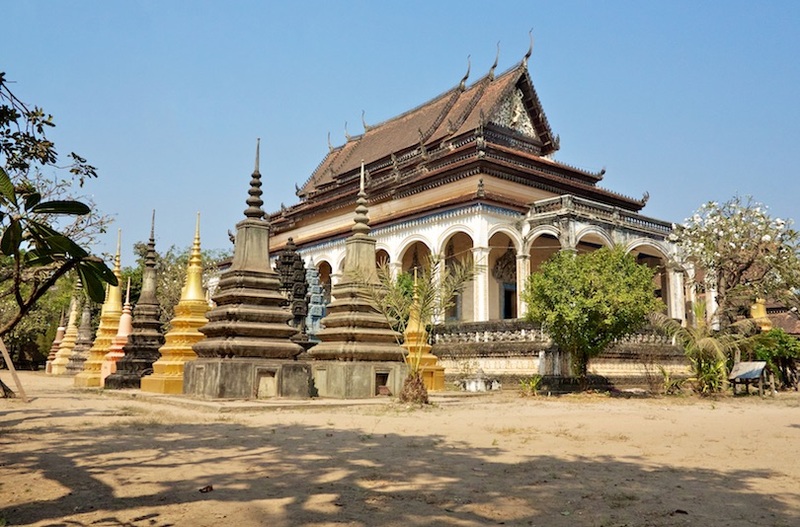 The rooms are large and delicately decorated, with Khmer inspired interiors, including wooden ceilings, a lot of silk and ornately carved details in the wooden furniture. There’s a luxurious spa and beauty salon for extra pampering opportunities. Guests can choose from four different dining options; in the evening, there’s live music at the Tropicana Bar. Home Indochine D’angkor Hotel – This small hotel is situated along a quiet side street just across the river from the Old Town. With that in mind, it’s a calm and tranquil environment to relax in. There’s a chic outdoor pool with all the sunshades and loungers you could need. Rooms at this 4-star offering come feature top amenities and are eye-catchingly stylish, with patterned floor tiles, four-poster beds, and elegant lighting. The restaurant and bar serve up delicious dishes and drinks. eOcambo Village – There is a selection of different rooms on offer at this hotel to suit different budgets. These range from simple but charming offerings – which are bright and colorful and feature murals of traditional Khmer life on the walls – to more stylish, upscale and spacious rooms with river views. There’s a relaxing outdoor pool, plus a rustic style restaurant offering a menu of local dishes. Wat Bo is just steps from this hotel. 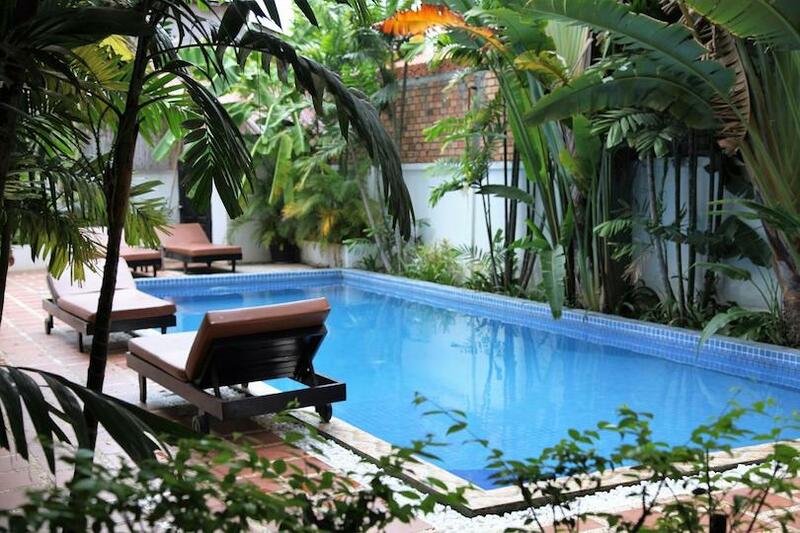 Ladear Angkor Boutique Hotel – Surrounded by beautiful tropical gardens, this boutique hotel offers a simply stylish stay in Siem Reap. 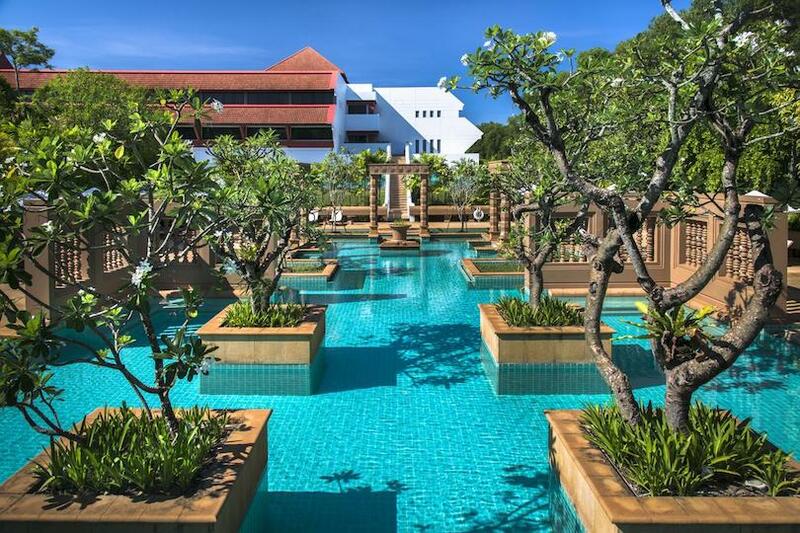 This 3-star hotel boasts two swimming pools, as well as a casual bar and elegant restaurant. The rooms are decidedly sophisticated, accented with silks and wall art. They also boast balconies and modern bathrooms. 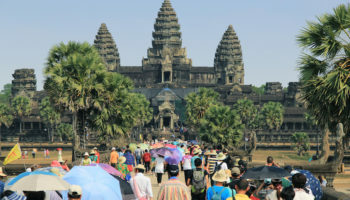 If you are in Cambodia to see Angkor Wat, which of course most people are, then you will more than likely travel along the Charles de Gaulle Boulevard. Running from the centre of Siem Reap, it is the main road to the great Angkor Wat itself, meaning everyone who is travelling to see Angkor will pass along the boulevard at some point. 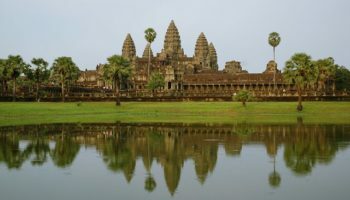 The best time to see Angkor Wat is at sunrise when the temples are illuminated by the golden sun and the hordes of visitors are at their lowest – so to be in with a chance of beating the crowds, staying close by at a hotel on Charles de Gaulle Boulevard is a great idea. The location of a hotel on the boulevard that is so close to the temples comes at a price: most of the hotels along the road are large 5-star complexes which offer international guests who have come to see the great temples of Angkor in style and luxury. Not a place that you are going to find the backpacker crowd of Pub Street, the hotels often have their own restaurants and amenities to keep guests entertained during their stay, as well as transport to the site of Angkor itself. 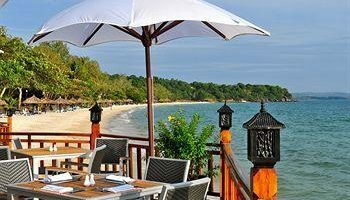 Victoria Angkor Resort – This is a French-style boutique hotel that boasts luxurious colonial elegance. The high-end rooms are beautifully detailed with custom wooden furnishings; some feature four-poster beds, hardwood floors, and balconies. Spread over two floors, the hotel boasts three different restaurants. There are spa and fitness facilities, a children’s playground, and two outdoor pools. Situated just a few minutes by tuk-tuk or taxi to Angkor Wat. Silk D’angkor Boutique Hotel – The lounge and lobby of this hotel are decorated with an impressive amount of wooden furniture and carved wooden walls, with elements of Khmer design and aesthetic throughout. There’s a large outdoor pool for guests to enjoy surrounded by trees, plus massage facilities for that extra bit of relaxation. Delicious food is served daily in the onsite restaurant. Angkor National Museum is close by, and the hotel’s tuk-tuk service makes it easy to get anywhere – including nearby Angkor Wat. 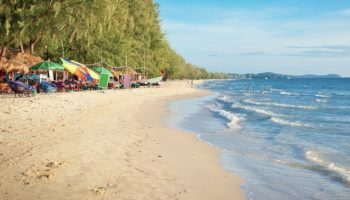 A main highway that connects the northern section of the city and cutting across the local Phsar Leu market, National Highway 6 is a great choice of area to base yourself in Siem Reap if you are arriving in the city by plane. With the airport a quick and easy taxi ride away, the highway runs past in front of the Royal Residence before intersecting with Charles De Gaulle Boulevard which is the main road into Angkor, and then continuing on to cross the Siem Reap River. The hotels on National Road 6 offer a slice of luxury in an up-and-coming area, which offers accommodation for people who want to relax in spa hotels and enjoy dining in hotel restaurants during their time in the city. The highway also has a good selection of accommodation from guesthouses to bed-and-breakfasts. With amenities like coffee shops and malls just a short walk away, the local area around National Road 6 also has some delicious restaurants and local eateries for you to try out in the evenings for dinner. Lotus Blanc Resort – A huge, elegant, and romantic place to stay, the Lotus Blanc Resort features a wide swimming pool and rambling grounds. The rooms are spacious and feature hardwood flooring, elegant decor, and bright aspects. Guests can enjoy decidedly high-end dining in the hotel restaurant. The busy Pub Street is a 10-minute tuk-tuk ride away – a service provided by the hotel. La Residence Blanc D’Angkor – Featuring a sizeable outdoor pool fringed by tropical greenery. The rooms in this large hotel combine contemporary design with touches of traditional Khmer aesthetics and wooden details. The rooms also boast murals of Angkor Wat. Guests can dine in an elegant poolside setting if they choose. The hotel provides a free shuttle service to the city center. 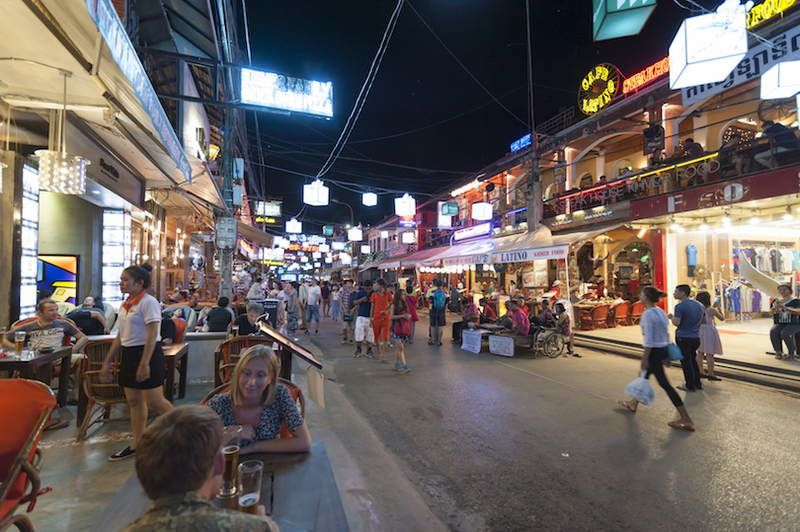 The area of Sok San Road is where you will find the lively backpacker area in Siem Reap: this is the place to go if you want to be close to the very lively Pub Street and the many massage parlours and jewelry sellers. There area is buzzing and fun and makes up the central tourist area of the city. As such, tuk tuks and taxis are always readily available and a whole range of eateries serve up a good standard of food to visitors from Asia and the rest of the world. This is a place where people come to meet and mingle over a glass of beer after a busy day’s sightseeing. 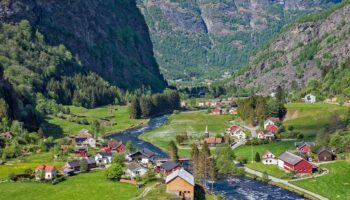 Because of the influx of backpackers to the area the accommodation is often to the lower end of the scale and dorm beds can be offered very cheaply, as well as clean and modernized family-run hotels. Some mid-range options with the luxury of a swimming pool are also located in the district, and are often extremely affordable. Even though a lot of the bars close by pump out loud music until late at night, there are quieter streets just behind, such as Steung Thmei Road, which offer a quiet night’s sleep in the city. Visoth Boutique – A small, charming place to stay, Visoth Boutique boasts a compact pool for a refreshing dip, as well as colorful bedrooms with wooden floors; some of these have sliding doors that open up onto the pool. The onsite restaurant serves traditional Khmer dishes for a chance to try local cuisine. There’s bike rental available to explore the local area. La Da Kiri Boutique Hotel – With bright, spacious bedrooms decorated with a monochrome color scheme, La Da Kiri Boutique Hotel is a compact, charming and stylish offering that boasts its own spa and fitness center. 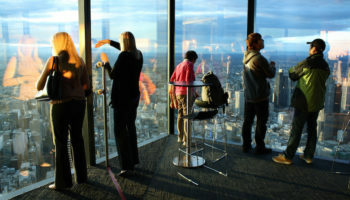 Some rooms have balconies and seating areas. Guests can dine at the in-house restaurant and have a drink in the bar. A small pool is available to cool off in, as well. The surrounding streets are packed full of restaurants but you can still get a peaceful night’s sleep here.